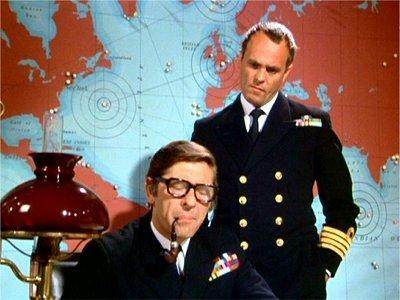 Straker is intrigued when a UFO targets a Naval vessel in the Atlantic. But when he presses for further details from the Admiralty he gets stonewalled, so he has to find out what he needs to know another way. Although he has the latest cutting-edge technology at his disposal, he decides to obtain the information in the old-fashioned way – with a mole. He asks Paul Foster to seduce the Admiral’s secretary and find out everything that he can. And even more eye-opening than this, Straker asks Foster to do it after he’s taken him out for a round of golf. I never pictured Straker as a golfer, I have to say. The Admiral’s secretary, Sarah Bosanquet (Stephanie Beacham), is rather gorgeous so this isn’t Foster’s most demanding mission. But things get more complicated when he realises Sarah is passing information to the aliens. And eventually the full story comes out – the Navy are dumping barrels of highly toxic nerve gas, which for some reason the aliens have decided to destroy. If they succeed, then the gas is capable of wiping out all life on the planet! Dennis Spooner was a new writer to UFO, and it’s possible that he hadn’t studied the programme format too closely, as it’s totally out of character for the aliens to want to destroy all life on Earth. Up until know, all the evidence has pointed to the fact that they need to harvest humans for body parts in order to survive, so why the drastic change? As so often, there’s no answer given, but notwithstanding this, Destruction is a very decent episode with a strong guest cast. Apart from Stephanie Beacham, there’s also Edwin Richfield as Admiral Sheringham and Philip Madoc as Captain Steven. There’s possibly a little too much stock footage of naval vessels, but that’s only a minor niggle. This story is also notable for being the second in this production block to feature Wanda Ventham as Colonel Virginia Lake. She had appeared in the first story, Identified, and after George Sewell was unavailable for the second recording block it seems his lines were ported directly over to Colonel Lake. No mention is made of Freeman’s absence or Lake’s sudden appearance, because these episodes were dropped into the whole run of 26 at various points. This must have been somewhat confusing for viewers at the time, as characters would appear and disappear at regular intervals. The somewhat haphazard transmission order has meant that over the years many fans have debated the best order to watch the series in. I’ve followed the order on the Carlton DVDs, which was suggested by Fanderson and is generally held to be as good as any other. For anyone who wants to look into this thorny issue further, then this is a good place to start.